It's #ThrowbackThursday and we want to know if there is a PBS memory or moment that inspired you to teach? A character or show that struck a chord with you as a child (or adult)? Why do YOU love PBS? Share your favorite PBS memories in the comments below, and you could be featured in an upcoming #ILovePBS blog post! 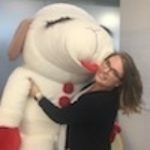 Have photos of you dressed as a favorite PBS character? With a favorite PBS stuffed animal? A character-themed birthday party? Share them with us on Twitter (@PBSTeachers) and Instagram (@PBS.Teachers) by tagging us and using #ILovePBS.